I am really into shape lately- wanted to share some mushroom photos I took from the "back 40". That's what my dad calls the very back of our yard. They will be a series of monochromatic pieces soon. My focus is on creating art from photos that we take. 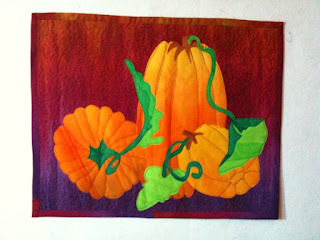 I finished Maddie's "Benjamin must have been laying in flowers...." art quilt last night. Bound it in purple and have Benjamin these funky red-Violet eyes. Maddie love it. Drew and I hung up this basket of flowers out side and put a tiny little humming bird feeder inside. You see them perched on there all they time. The hummers go between the feeder and the flowers to eat. Below you can see the "discount" wild flowers we planted too. They are a bit crazy but very pretty. 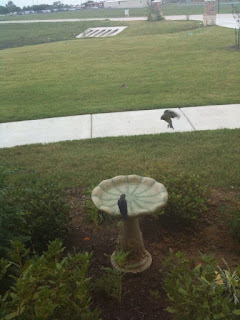 Mary and Maddie picked out this bird bath for the front. It has a little brown bunny on the front that is sitting in flowers. Fitting since there is a tiny gray bunny that lives in the bush right behind. View from my office chair. 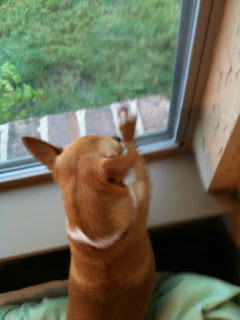 I can watch the birds- you'll know when I am slow to answer emails and get design work done. Its a perfect place to day dream...Best of all I can watch the girls school from the window. 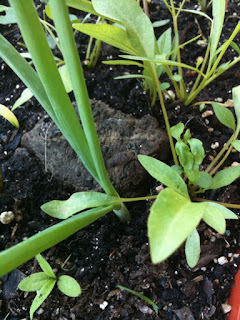 One of the things I like best about organic gardening are all the visitors we get- this frog was just too cool. We need to look it up and find out the name and info. It was a bright green with webbed feet and big eyes. Not at all afraid of us, at one point while I was taking photos, I swear it turned to face me and pose. What a ham! When the girls got home from school today we ventured out into the nice cool weather to see how our flower beds were doing. For some reason today- not sure if its all the rain or the cool weather but the flowers all seemed to be extra colorful and bright. The humming birds are loving it. A perfect time for them all to bloom so the hummers can fatten up for their long journey. The orange and white flowers were planted last month from wildflower seeds we picked up at Walgreens in Allen for 10 cents a package during their remodeling sale. 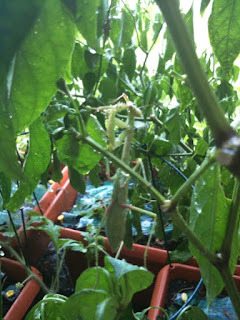 We organic garden so praying mantis are welcome- well until I read about how they can attack hummingbirds. So now it has a new home in my studio until the Hummers fly south in a few weeks. 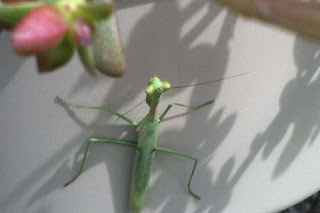 Reading up on the praying mantis was interesting a good resource was on about.com. I have it in a nice large container that fits inside of a mesh lingerie bag. 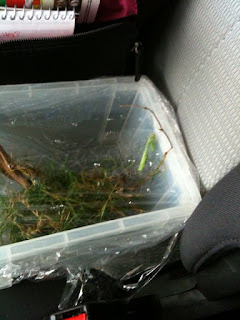 It will be very well cared for and loved until it can go back outside in a few weeks. A beautiful rainbow over the water tower in Lucas, Texas. It rained here in Lucas, Texas for over a week straight. Not that I am complaining- I happen to love the rain. No gardening was done during that week so when it stopped raining and I went out to check on the tomato "crop" it was gone...literally nothing left but stems. Photos I took today of the flowers and plants in our garden- they loved that rain! I took this photo a few days ago. It was on a rainy day in September. The rain has stopped for a while- it rained here in Lucas, Texas for about a week and half. You can tell the hummingbirds are getting ready to fly south for the winter- look how fat they are getting. at a Frieda Anderson workshop last year. In the book "Color and Composition" it talks about the basic principals of design layouts. 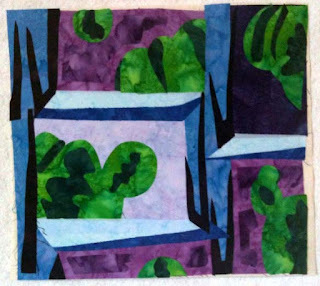 I thought it would be fun to make a small journal quilt to hand in my studio for each of the principals. Each of the finished design mini have been/will be made using left over scraps from the other exercises in the book (waste not want not). These are the three I have made so far. 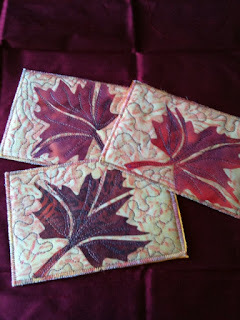 Some day when the series is complete they will be quilted and bound- not sure it they will be individual or all one piece? Since this series is not about color but about design- I plan to use the complimentary color for the bulk of the scraps to make the design stand out. If I have not said before in previous posts- I highly recommend this book for any fiber artist beginning or experienced that wants to really refine their skills. Not only are the photos inspiring but the exercises and ideas are practical and creative. 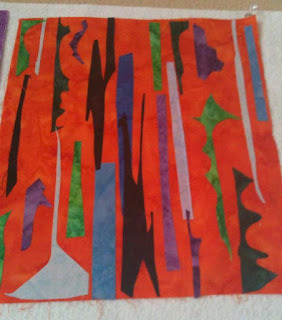 You are not making someone else's quilt designs with their colors- instead you are using your photos and imagination to design patterns and then select colors. 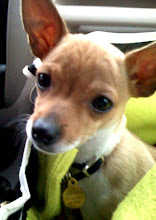 A few weeks ago at dinner, Maddie picked up Benjamin (our chihuahua) buried her nose in his fur and too a huge whiff. Her face turned bright and with a huge smile she said, "Benjamin smells so good! Did you give him a bath today?" "Oh... well then he must have been laying in flowers" How cute is that! 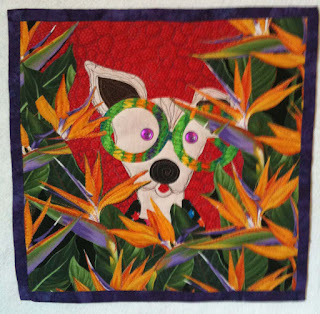 The top is about 18" X 18" I free motion quilted it the other day to add details to Benjamin's fur and face. It just needs the binding and buttons on the eyes. Exercise from "Color and Compositon"- Cool Color Scheme. 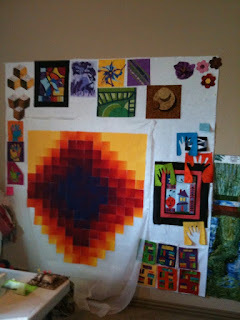 For this exersise we were to make a small art quilt with only cool colors or only warm colors. 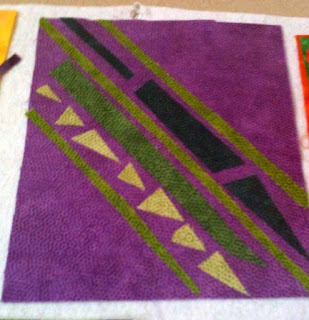 This quilt was based on the book Quilt Counting by Lesa Cline-Ransome. 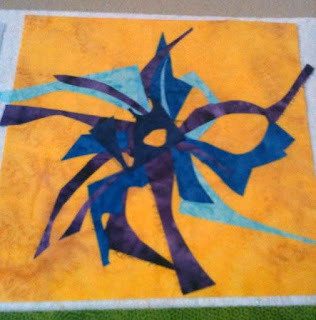 It was purchased through a grant from the Junior League of Plano to be donated to the Allen Quilters Guild Story Book Quilt Program. 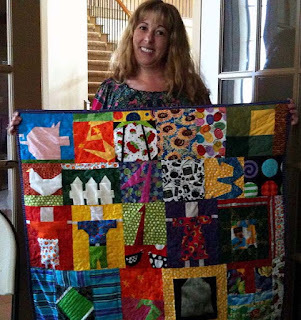 The quilts along with the books will travel to different libraries for children and adults to enjoy. Every morning for about a month now when I go out to water my patio garden there is a hole inside one of the flower pots. It is a good sized hole so I have been really curious about what was making it. The toad is still there today in the pot- in a new position today and I did see it out of the pot around 5am this morning. For some reason this toad has decided that our patio is its new home. "Freddie" or "Fredina" is welcome to say for as long as it wants too. The kids love to look at it but are under strict orders not to go near the pot and under no circumstances are they to touch the toad. From what I have read online the Texas Toad breeds in September and sometimes uses man made ditches. And that they are know for burrowing and flattening themselves out to not be seen. The toad is quite large my best guess is between 2 1/2 to 3 inches. Maddie's fabric hair curls on the bottom like hers. Maddie also snagged a "flower" for her hair. 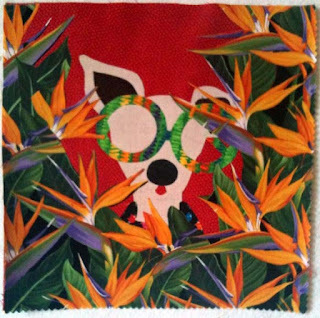 (Of course she/they do not take into consideration that the flowers the "picked" from my design wall where all hand English paper pieced that took me hours......:0) She has a silly flower nose. 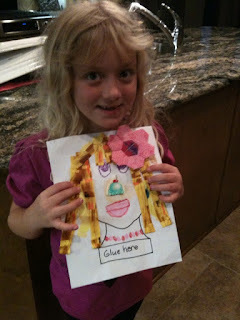 Thought it was interesting that they did not make their self portraits at the same time, but both of the girls drew almost the same exact necklace but in different colors- must be a twins thing? 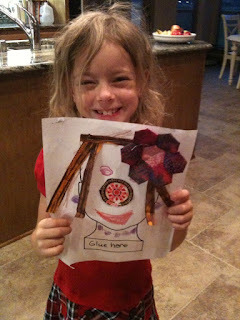 spotted a hand pieced flower from my design wall that would be just perfect for her hair. She was very concerned about choosing a fabric that reflected her "true" hair color..."You know that my hair is yellow with a little brown...." Also notice the bangs of fabric hair, Mary is very proud for her first hair cut and the bangs. Mary drew her nose but was not happy with how it turned out to when all else fails...you can sew something over the top...she choose an ice cream nose. This was a really fun and creative assignment. When we got up this morning this huge pray mantis that has been living on our orange tree has taken over the hummingbird feeder. 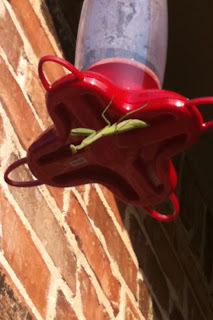 It is so large that it is literally swinging the feeder and has almost emptied out all the nectar. A little concerned about the impact for the hummingbirds- need to google if they play nice together. One of the things we love best about our new house in Lucas is all the wild life- Especially the birds. Since everything is on clearance now for the fall/winter Mary and Maddie picked out an adorable bird bath at home depot. It sits out front of my studio window. The most adorable little baby birds visited today. They can barely fly. They have a dark brownish blue back with rusty-red chest and bellies. They are covered in the really fluffy baby feathers- they look like little fat cotton balls. 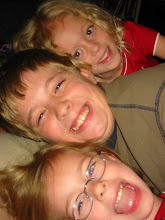 Today is the twins birthday. Maddie wanted pet shops and Mary wanted roller skates. The video is of Drew trying to help Mary skate- its wicked funny! 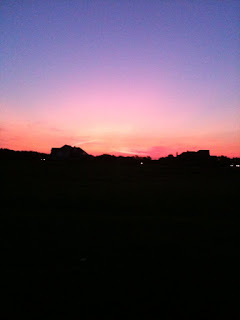 In the middle of the night last night these colors called my name. Fall is officially here at the Ray's when the deep autumn colors come out to play. Since I am not formally trained one of my goals this year was/is to work my way through several design and color books. Right now I am reading Color and Composition for the Creative Quilter by Katie Pasquini Masopust and Brett Barker. 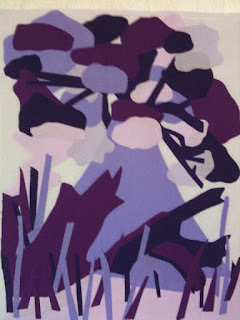 This was an exercise in Monochromatic Color Schemes. One of the things I am really enjoying about this book is that she encourages you to use your photos and drawing to make art quilts. 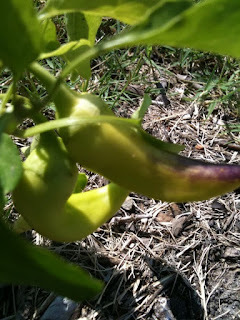 Our first harvest of banana peppers. We harvested a lot. Planning on pickling them. September 1, 2009 sunrise out our kitchen windows.